After booking a 12 day cruise around the British Isles, Marjorie decided that we needed a longer stay to amortize the cost of the flights and the 7 hour time change. 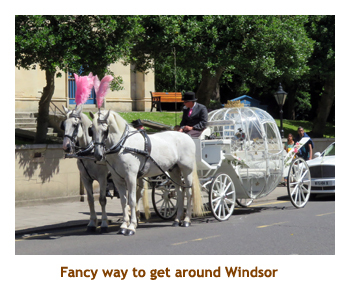 She found an interesting bus tour of central England / Wales by Royal Irish Tours. 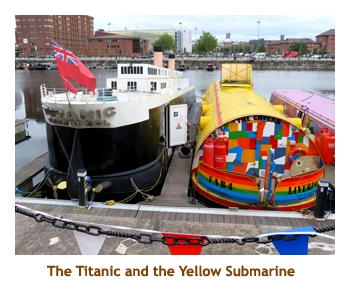 We had visited Britain several times in the past on cruises and a land tour, and done many port days in Ireland and Scotland but only one of the stops was in England (Liverpool). We had also done Dover and Southampton, but only as cruise terminations, so you can't really count those. This tour would take us to locations that we had never been to before (except Liverpool). 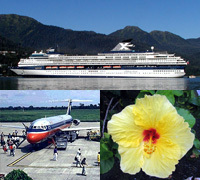 The timing of the tour was ideal, covering the week before the cruise, and ending one day before the cruise began. 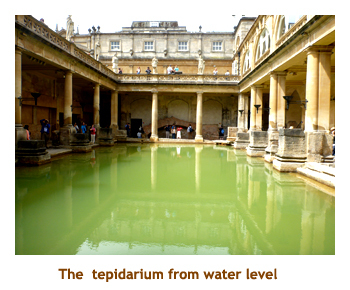 You can see the diary for the cruise portion of our trip in our British Isles diary. We had 23 people in our group so we kind of rattled around the 45 person bus. It was nice having all of the extra room. The travellers were all Canadian mostly from Ontario. We were the only ones from Calgary. We left home at 4:00 PM and arrived at Christina's at about 5:00. We dropped off our car and Christina drove us to the airport around 5:45. Check-in was quite quick and there was no line at all at security. We shared a sandwich at Subway and were to the gate by 6:45. Our flight to London Heathrow was ontime at 8:10 and we arrived at LHR about noon the next day. We went through British customs (huge lineup) and grabbed our luggage from the carousel. As we exited the secured area, there was the shuttle driver from the MacDonald Windsor Hotel waiting for us - our names on his sign. 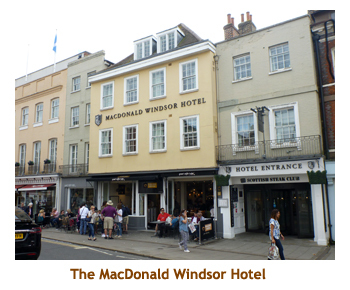 The shuttle took about half an hour and dropped us off at our hotel in Windsor. We had only 30 minutes to shave and freshen up before leaving at 2:15 on a tour of Windsor castle. The castle was right across the street from the hotel so we didn't have far to walk. We stopped at the entrance to the castle grounds and were given a talk about the history of the castle. Then we were let loose to wander on our own. 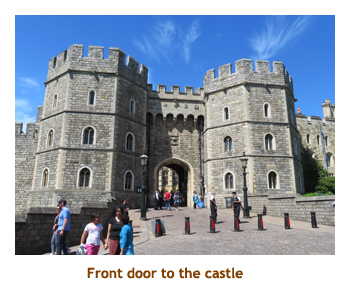 One wing of the castle was the Queen's residence, and the flag on the tower showed that she was currently living at the castle. She didn't come out to see us. 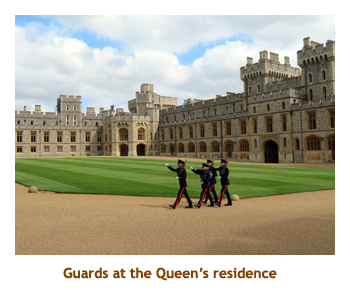 We toured through the royal apartments, the "doll house", some other buildings and St. George's Chapel. 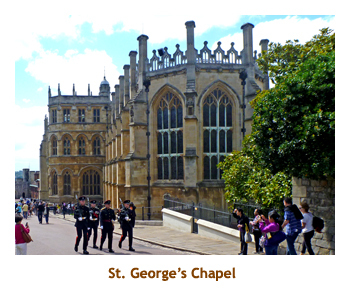 The chapel is the burial place of a veritable "who's who" of British kings, queens and other royalty. From one of the ramparts one could see Eton College in the distance. Our tiredness was catching up with us so we walked back to our hotel, arriving about 5:00. At 6:00 we had our "welcome" dinner at the hotel and formally met our travel mates. Some had come from the previous Scotland tour, while others like us had just flown in. Afterwards we did a bit of a walk around the hotel area to work off our dinner. Then it was back to the hotel, pop a sleeping pill and to bed. It sure felt great to lie down after two days of travelling! Today was the start of our traveling protocol. Bags packed and out in the hallway by 8:00 AM, down to breakfast at 8:00, then onto the bus by 9:00. We were up at 7:00 still feeling buzzed from our long travel day yesterday. It was going to be a warm, sunny day. We had a good buffet breakfast and were on the bus ontime and ready for the day. The drive to Oxford took about an hour, mainly on a motorway. 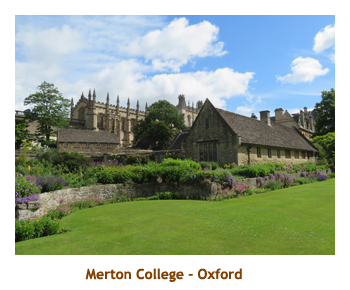 We had a bit of drive through Oxford finally stopping a short distance from Merton College. 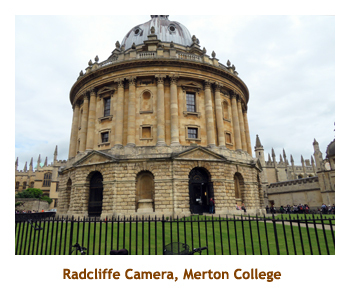 Oxford University consists of 36 separate colleges (like faculties) and Merton is the oldest (13th century) and most famous. 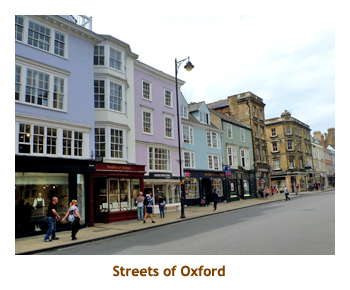 The colleges were spread out through the city of Oxford, so there was no definitive contiguous area that "was the university". 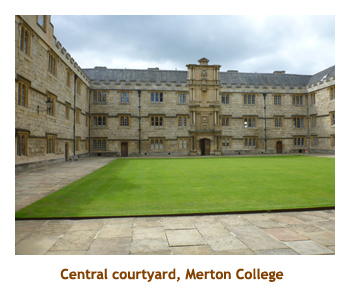 We walked through the Merton courtyards and were lectured on the various buildings and past students. Afterwards we walked out of the college and onto the commercial streets of Oxford. We were given an hour to explore and have lunch. Our wanderings took us to Burger King which was too much to resist. 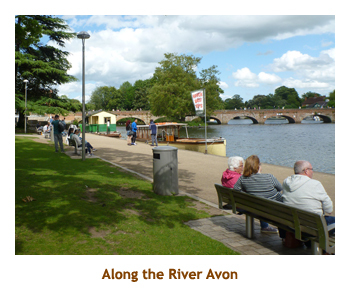 Then it was back on the bus heading to our next adventure - Stratford (upon Avon). We continued on towards Stratford through the Cotswolds. It was beautiful countryside. 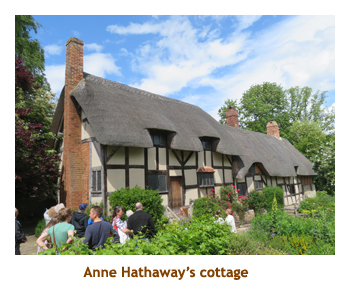 Outside of Stratford we stopped at the famous Anne Hathaway's cottage. 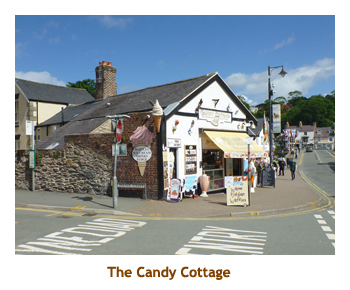 The cottage had been much amended since Anne's days, and her original cottage was just a small portion of the cottage extant today. We toured through the cottage and folks in period costume explained the rooms. 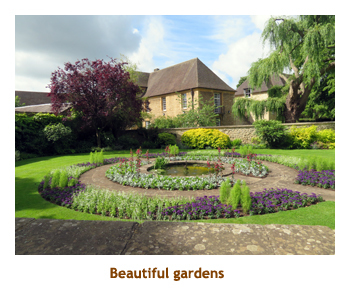 There were some interesting gardens by the cottage - herbs, veggies and flowers. Then we boarded the bus and drove into Stratford. 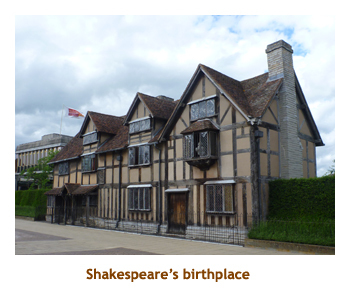 We did a walking tour of the main street, and visited the house where Shakespeare was born. 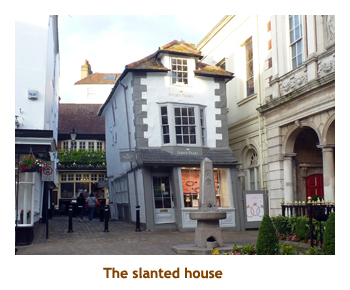 Like Anne's cottage, the house had been amended over the years. 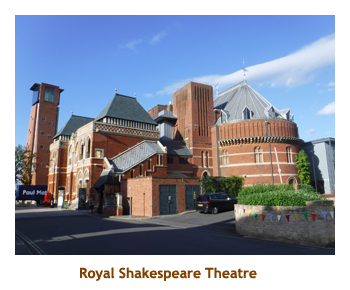 The town had taken full advantage of this famous son, with several theatres and many monuments to both the bard and his cast of characters. 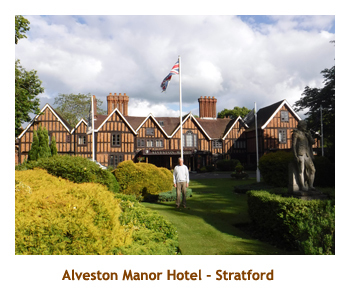 We checked into our hotel (Alveston Manor) and headed out for dinner and evening "on our own". Marjorie had read up on the "Dirty Duck" pub so we tried it for Sunday dinner. We split a beef rib pot roast dinner and it was plenty for the two of us. 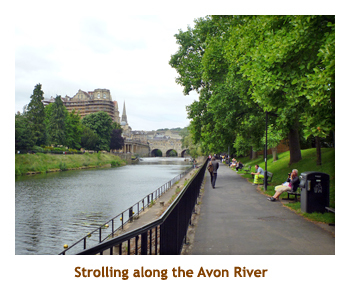 On the way back to the hotel we wandered along the Avon River. The public market was still going and lots of people were out for a stroll. A lovely day. Today was our longest drive - from Stratford to York. Unlike the past few days, it was mostly cloudy. We were up at 7:00, bags out at 8:00, breakfast at 8:00 and onto the bus by 9:00. 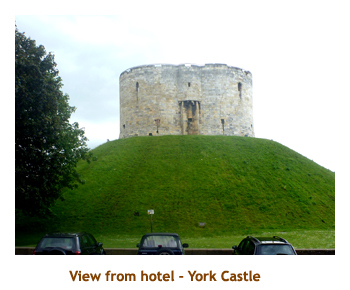 We drove north on the motorway and arrived in York about 2:00 in the afternoon. 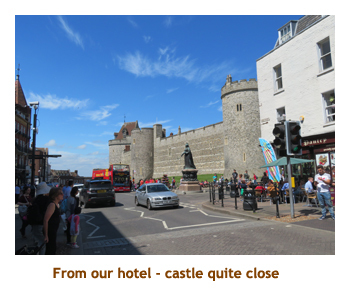 We checked into the York Hilton (the hotel was right across the street from York castle). We were given until 3:00 to find lunch. We headed to a fish & chip shop (Drakes) that the guide had recommendedand and split a senior's portion of cod and chips - excellent. 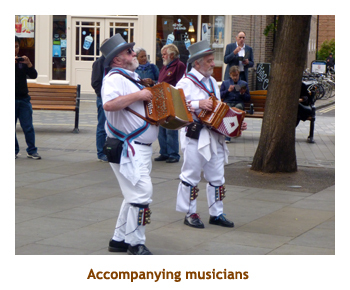 At 3:00 we met outside the hotel for a walking tour of Old York. 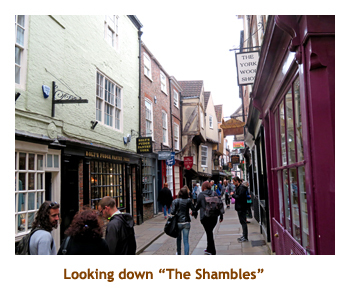 We walked down "The Shambles", the most famous street / area in York. Lots of history there. 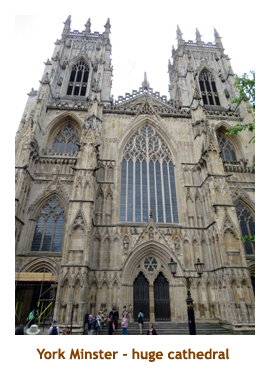 Then we popped into York Minster (formally known as the Cathedral and Metropolitical Church of Saint Peter in York) for a look-see at an amazing Cathedral. 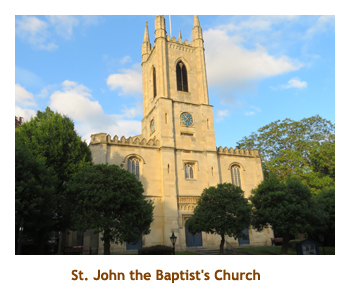 The Cathedral was built in the 12th century on the site of several earlier churches which were destroyed over the centuries. We were given some free time on our own to explore Old York, meeting back at the hotel for a group dinner at 6:00. After dinner we explored the area nearby the hotel and stumbled upon a group of costumed men dancing to several musicians. It was quite entertaining. Then we hiked back to the hotel and went to bed. 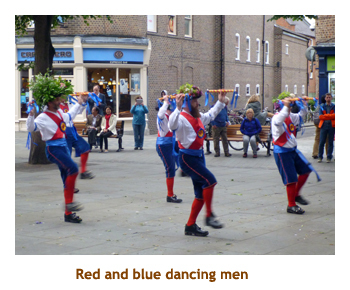 Note: When I got home I googled the dancing men and it turns out that they are morris dancers. 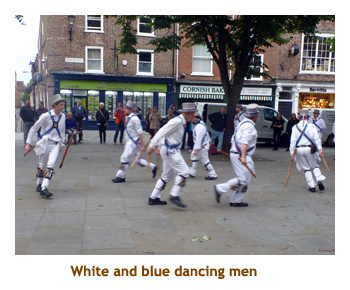 This form of dance orignated in England in the 15th century and now has adherents all over the world. We were up at 6:00, with bags out at 7:00 and breakfast at 7:00. We had to be on the bus by 8:00 ready for our drive across England to Liverpool. (York is east coast, Liverpool is west coast). The drive was interesting - some motorways, some countryside. We arrived in Liverpool about 11:00. We had a bit of a bus tour through the city, and then were dropped off at the waterfront near the cruise ship terminal. It was a grey, cool day, so not the best for photographs. 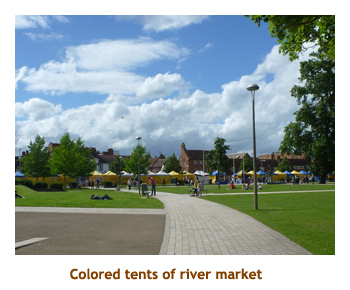 The city had done a load of work on the old industrial area which now supported souvenir shops, restaurants and musems. We had been here before on a cruise in 2009 and I couldn't remember most of the new development, so it must have been completed very recently. 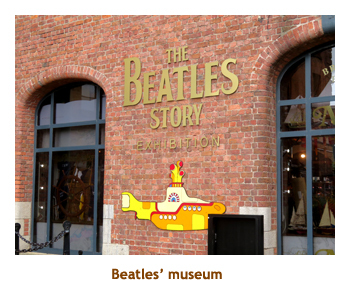 I had underdressed with only a t-shirt, so we popped into one of the shops and I bought a Liverpool sweatshirt.. We did two museums (Beatles and Maritime) which were both free! 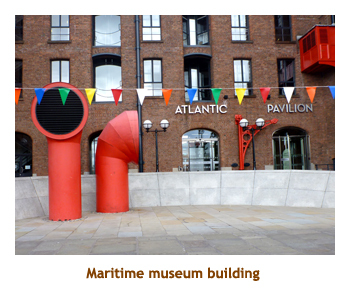 At the top floor of the maritime museum was a recommended restaurant so we had lunch and rested our legs. 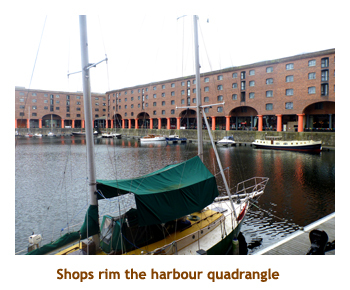 After lunch, we wandered the Albert Dock area. We walked to the cruise terminal and saw a large cruise ship docked there. We eventually chanced upon a National Express office. 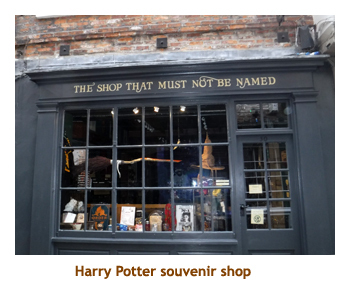 We took the opportunity to purchase our tickets for the Gatwick airport to Southampton bus trip coming up in a few days. One less thing to worry about. 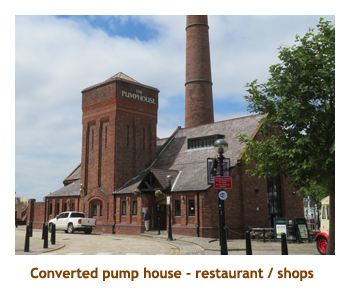 Then it was onto the bus for the short trip across the Mersey River to Chester. 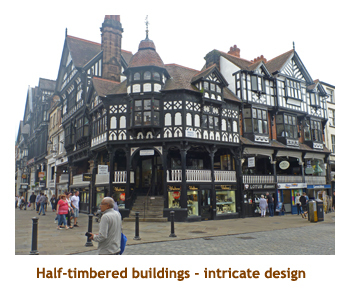 Before long we were in Chester and were let out in the old part of the city. 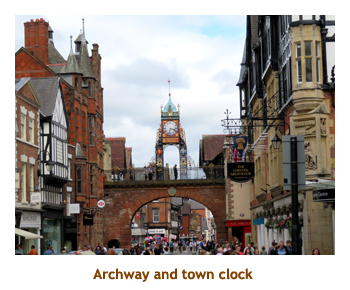 We had been to Chester in 2009 and did a city tour. 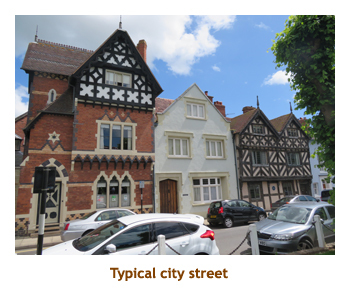 The old town really hadn't changed a lot. 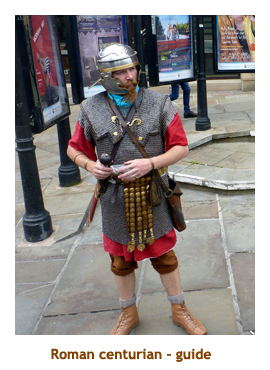 However,this time we were met by a Roman soldier who toured us around the strreets giving a Roman slant on the history and living conditions. It was an interesting viewpoint and I quite enjoyed the tour. 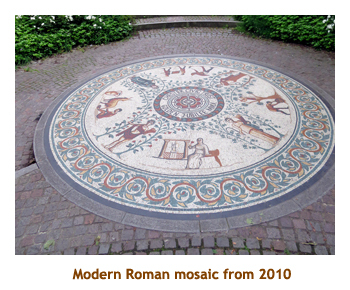 We saw a number of Roman artifacts throughout the tour that I couldn't remember from our previous tour which had concentrated more on the Medieval architecture and the cathedral. Nice to do something different. We were then given some time to wander on our own and it was nice seeing the familiar area that we had tramped through in 2009. 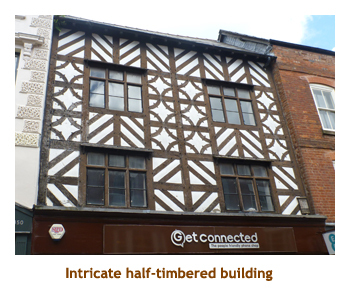 I really am fond of the half-timbered buildings. 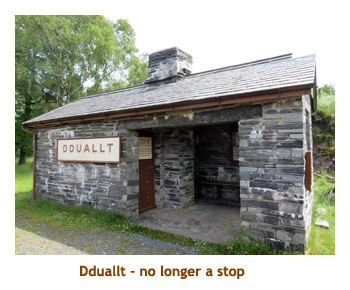 When our time was up, we returned to the pickup location to board the bus and we struck out for Wales and the town of Llandudno. 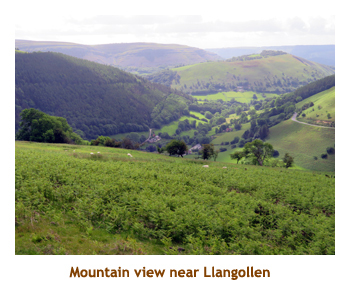 The drive through northern Wales was wonderful. Lots of green fields and sheep. We arrived in Llandudno about 6:00 PM. It was a tourist town with a row of hotels along the huge cresent beach. 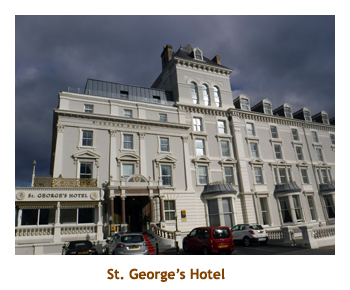 Our hotel was the St. George's and was lovely. We would be there for two nights. We had a group dinner at 6:30 in the hotel and then had the evening on our own. 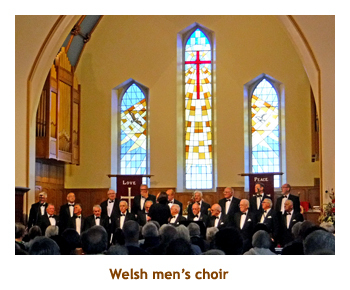 Our plan for the evening was to attend a Welsh men's choir in a nearby church at 8:00. However, the meal really dragged on (slow service). We ended up leaving the dinner before dessert was served and just made it to the church on time. The choir was excellent and I knew at least half of the songs, so we really enjoyed it. We wandered back to the hotel and then headed for bed. We were up at 6:30 with breakfast at 8:00. No "bags out" as we were staying at the St. George's tonight as well. 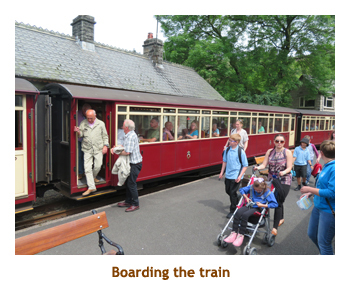 Today we would do a loop trip coming back to Llandudno by dinnertime. We had over an hour until breakfast, so did a long walk along the beach and hiked out onto the pleasure pier. It was eerily quiet along the pier - all of the rides were shutdown in the early morning. 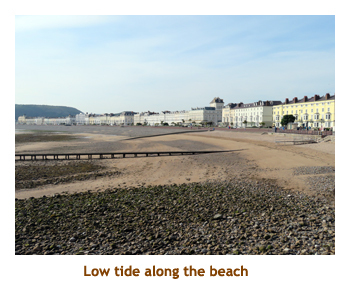 The tide was way out, so the beach seemed really huge. We had breakfast and then were on the bus by 9:00. 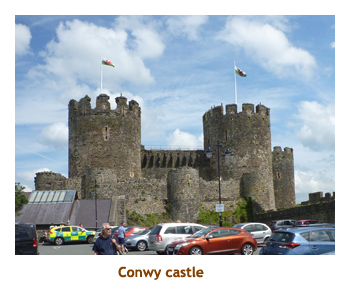 The tour started with a drive along the north coast of Wales through the town of Conwy where we had a preliminary glimpse of the famous castle that we would be visiting later in the day. 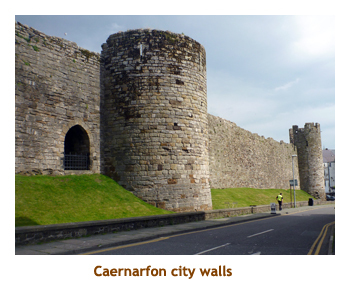 We continued along the coast until we reached Caernarfon (Carnarvan) Castle in the village of Caernarfon. We stopped in the main square right across from the castle. We didn't enter the castle, it was more of a photo stop. 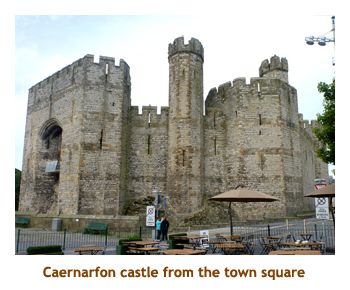 The castle was one of many built by Edward I, this one around 1280 AD. We spent about 1/2 hour there and then reboarded the bus. 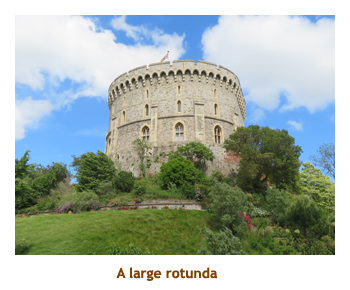 The driver circumnavigated most of the castle so we could see it from every direction. 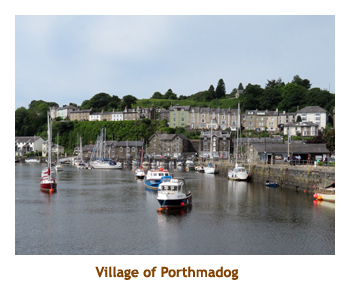 Back aboard the bus we drove south alongside the island of Anglesey, soon arriving at the seaside port of Porthmadog about 11:00 AM. 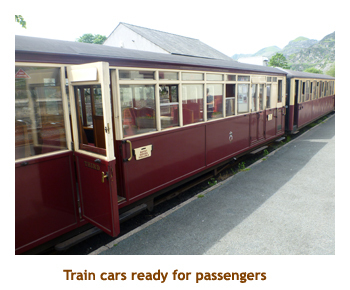 Here we were to board a steam train to take us into the heart of Snowdonia. 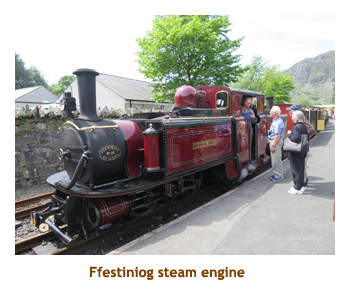 Our tickets for the Ffestiniog narrow gauge railway were for 11:30 so we had time to wander the village and buy some sandwiches for lunch on the train. We boarded the train and ended up sharing a cabin for four with another interesting couple. 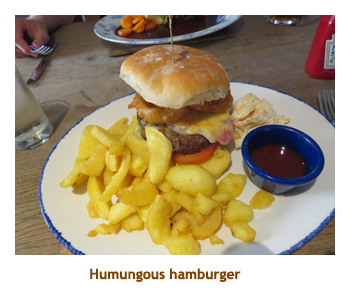 We ate our lunch as we rumbled through the countryside. Our view was of fields and villages - beautiful. 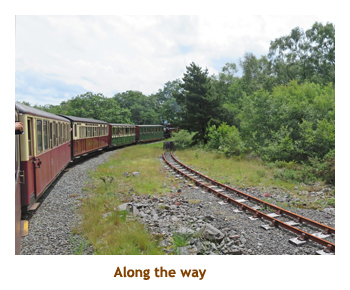 The train had stops at Minffordd and Tan-y-bwlch where we could get out to stretch our legs. 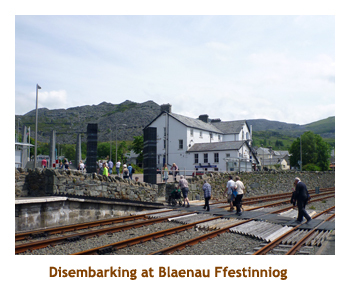 After 1.5 hours we finally arrived at the terminus village of Blaenau Ffestiniog. It was a wonderful train ride. We reboarded our tour bus and headed off for the sights of Snowdonia. 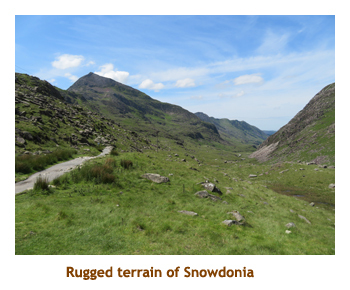 Snowdonia is a rugged, mountainous area in the northwest corner of Wales. The highest peak is Mount Snowdon. 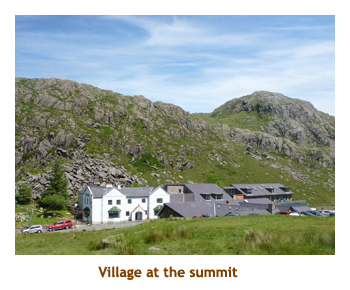 The surrounding hills are rich in slate which supported a huge slate industry in the 1800's. However, that market disappeared and now only the holes in the hills remain. 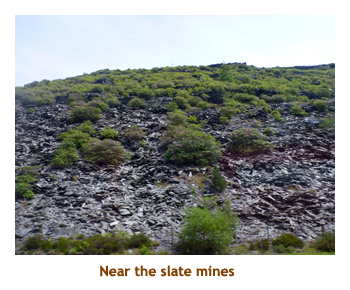 We passed many slopes jagged with slate and could imagine the life of the people working the mines. 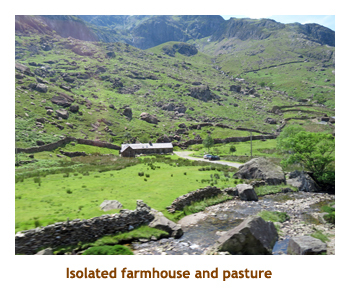 A good portion of the area is pasture now with sheep the main grazer. We stopped at the highest point on the road - about 3,000 ft - not a great height to us Rocky Mountaineers. 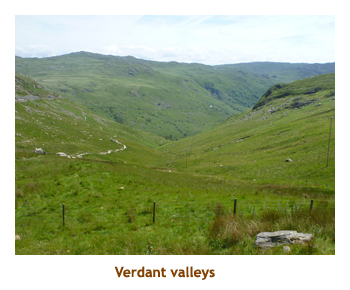 There we were given time to wander around, looking down green valleys, and up the rocky slopes to the peaks. There was a small village (ie. 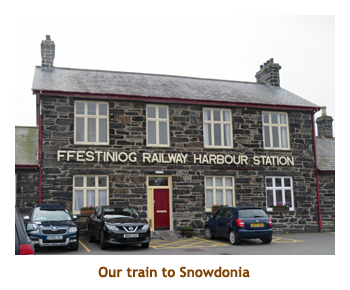 4 or 5 buildings) and I think there was a train terminus for a line that connects to the Ffestiniog railway that we just got off. Then we reboarded the bus to descend from the mountains and return to the north sea coast. We finished our Snowdonian loop tour back at Conwy castle, which we had seen in the distance this morning on our drive to Caernarfon castle. 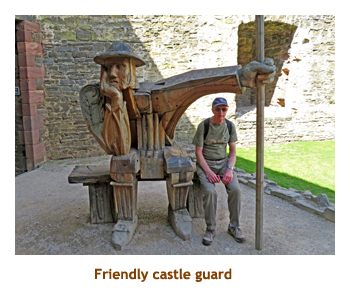 This time we stoppped at the castle and were given an hour to wander the castle grounds. 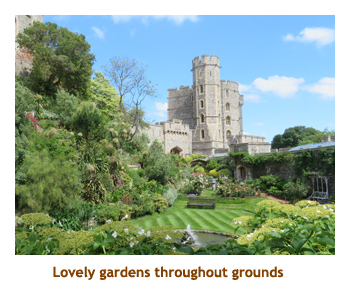 The castle was built by Edward I in the 14th century. 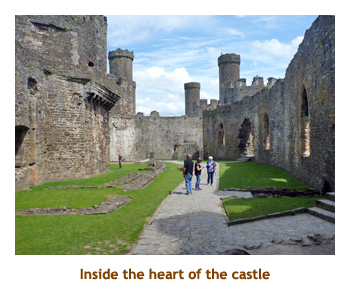 Our tour included admission to the castle so we strolled through the ruins imagining what it was like in the 14th century. 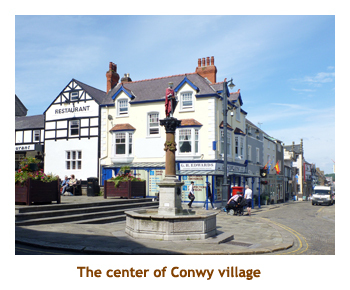 We had lot of time so explored a bit of Conwy village outside of the castle too. Back on bus we drove back to Llandudno, arriving at our hotel about 6:00. 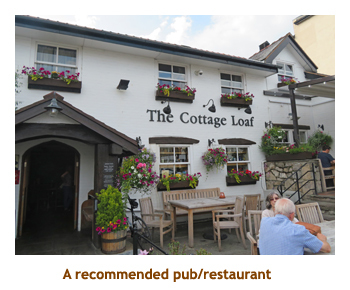 Our guide recommended the Cottage Loaf pub for dinner, a short walk from the hotel. We couldn't find it at first, so asked a sales clerk in a closeby store. She not only told us where the pub was (hidden in a nearby alley) but also explained that her father used to own the pub (small town!). 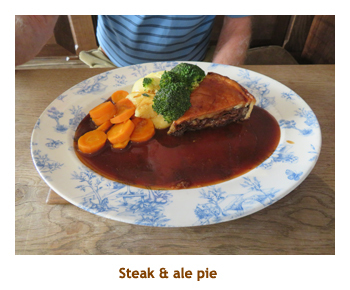 Marjorie had a humungous burger, and I had a steak and ale pie. Excellent! Afterwards we wandered back to the hotel and went to bed early. 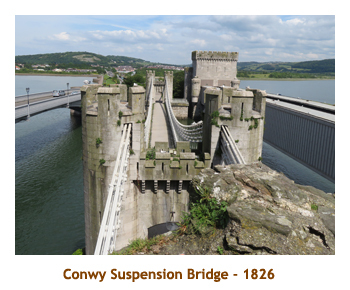 Today we would be traversing Wales from the north to the south. It was a mostly sunny day, great for taking pictures. We were up at 6:30, with bags out / breakfast at 7:30. 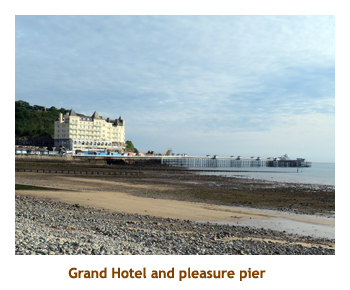 We were on the bus at 8:30 and waved goodbye to Llandudno, our home for two nights. 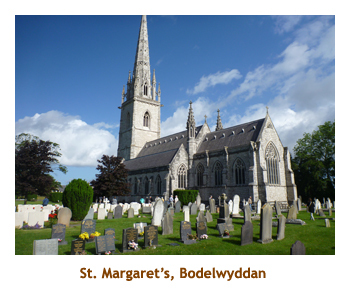 The drive south took us first to the village of Bodelwyddan, noted for a lovely little church (St. Margaret of Antioch, also known as the Marble Church) where 80 or so Canadian servicemen are buried in a section of the church cemetery. All of them died in 1919 while waiting for transport back to Canada at the end of the war - killed by the Swine Flu epidemic. How ironic that they survived the horrors of the trenches only to be killed by a virus! Being an all-Canadian trour group, our guide deviated a bit to take us to this unscheduled visit. 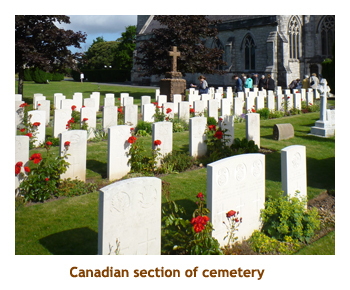 The graves were well tended in neat rows, with red roses and flowering shrubs between the headstones. Back on the bus we continued our southward journey stopping next for a photo at a green valley lookout high in the mountains. 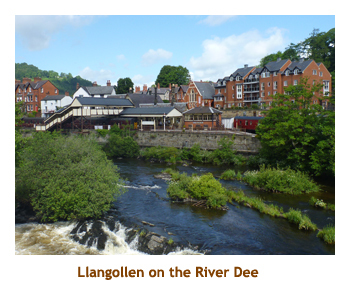 Then it was on to the town of Llangollen. 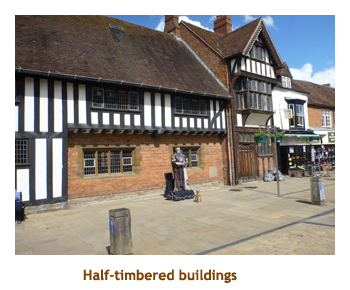 We had been here several years ago and the town looked just the same. We were given 40 minutes to wander around the town center . We didn't take many photos as we had done so the previous time. 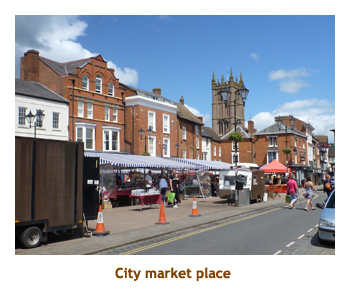 After another southerly drive we nipped over the Welsh / England border to the villlage of Ludlow. 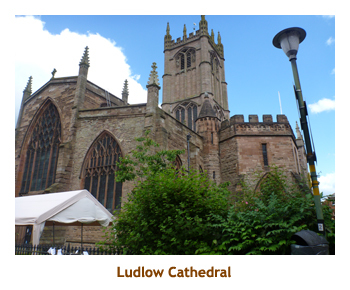 Over the centuries the border was fluid, so Ludlow had been English and Welsh at different times. We were given 2 hours to explore the town and have lunch. 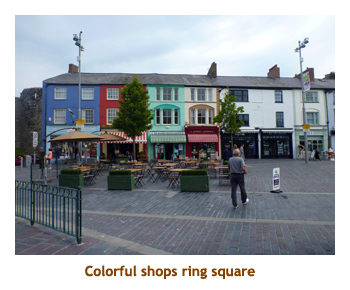 We wandered through the quaint streets, ending up in the town square. 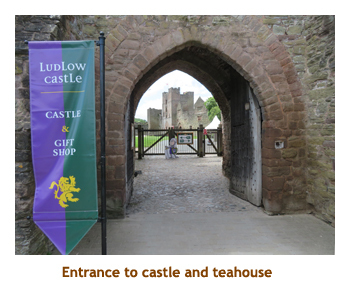 In the heart of the city is Ludlow castle, built in the 11th century. We walked over to the castle, but there was a charge to go in. 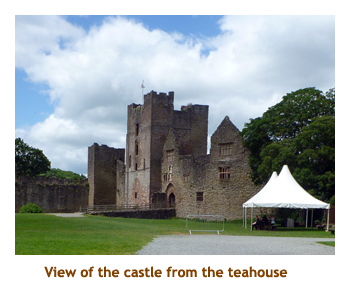 Instead, we went into a tea house that overlooked the castle and had a great salad and sandwich for lunch. Afterwards we went back to the town square where there was a large market going on. There were lots of fruits and veggies, as well as handicrafts. Then we were back on the bus again and heading towards Cardiff. Leaving Ludlow, we were also leaving England as we crossed the border back into Wales. 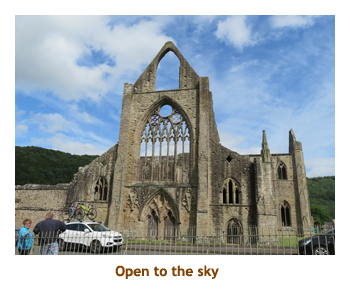 The next stop on our southbound journey was at the ruins of Tintern Abbey at the edge of the village of Tintern. 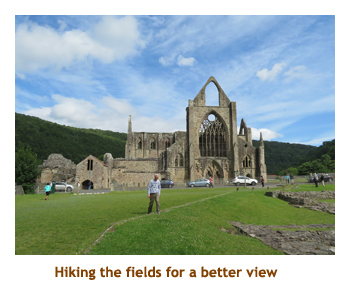 The abbey was built in the 12th century and fell into ruins in the 16th century (thanks to Henry VIII). 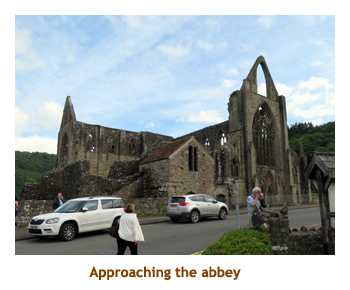 We were given 30 minutes to wander around the abbey grounds and, of course, take photos. 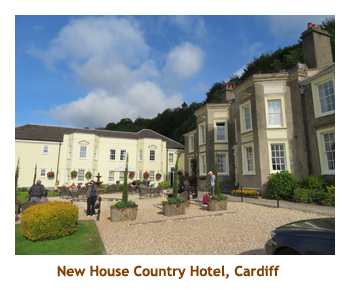 Our final leg of the journey took us to The New House Country Hotel just a few miles out from Cardiff, in the surrounding hills. From the hotel we could see the city in the distance. We arrived at the hotel about 6:00. The tour included a group dinner in Cardiff, at the new Civic Center with live music. However, Marjorie had been fighting a bad cold and didn't feel up to it, so we waved goodbye to the tour group and instead had a quiet dinner at the hotel. Talking to some of the group the next day, it sounded like everyone really enjoyed the evening. I think they returned about 10:30. Today was the final full day of the tour. 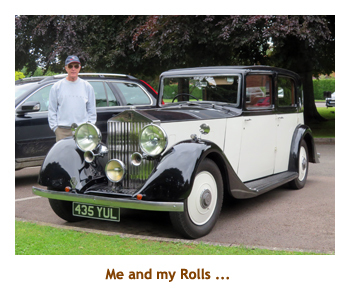 Our goal today was to drive across mid-southern England to London where our tour would end. 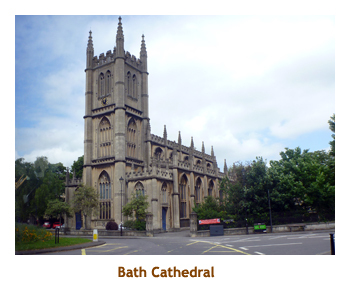 It was a long drive, so a stop was planned in the city of Bath. We were up at 6:30 with the bags and breakfast routine at 7:00. We were on to the bus at 8:00 and headed off on the 1.5 hour drive to Bath. 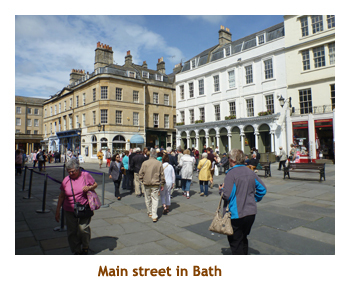 At Bath, we did a bus tour of the city - everything was a grey/pink sandstone (by city ordinance?). 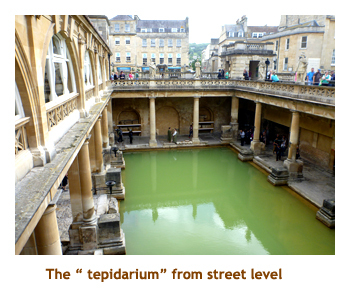 We had pre-arranged tickets for 11:00 to visit the ruins of the roman baths. 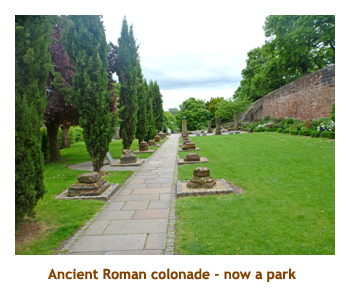 The city has done a wonderful job of creating a museum encompasing (and highlighting) the ruins of the original roman baths. We spent about an hour touring the museum, then were given 2 hours to wander the city and find ourselves a luncheon trough. 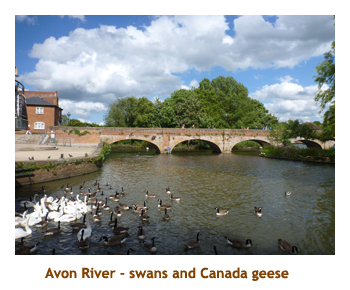 We walked around the old city area and along the Avon River, and found a pizza place for lunch. Back at the meeting place, the bus picked us up just after 2:00 and we headed off to London. The trip would normally take about 2.5 hours, but the traffic was dreadful and we didn't arrive at our London hotel until 6:00 (4:00 hours!). I do fault the tour company for not stopping for a break at one of the motorway service centers as 4 hours non-stop was a test of our senior's bladders! 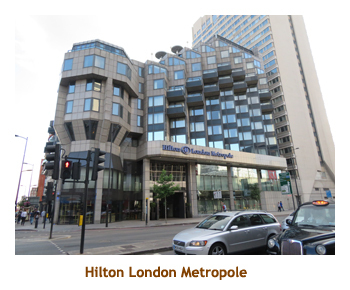 Marjorie and I weren't interested in a restaurant meal after our pizza lunch so, after checking in to the Hilton London Metropole, we popped across the street and bought a sandwich, crisps and a drink package at Mark's and Spencer's, which we ate in our room. We read a bit then headed to bed. Today was our "connect" day where we would reposition for our next leg - a British Isles cruise on the Caribbean Princess. We were up at 6:30 with bags out at 7:00. At breakfast we said goodbye to our tour buddies. Of the original 23 members, 2 had abandoned ship in Liverpool and 4 were staying on in London. The remaining 17 of us were hopping the 8:00 AM Gatwick shuttle, most to fly home. The trip took about 1:15 with lighter traffic than yesterday. 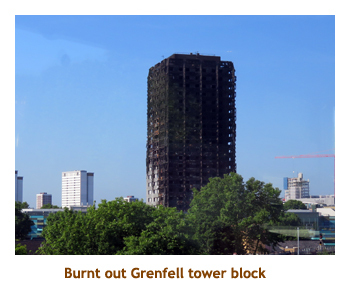 Along the way we went past the blackened shell of the Grenfell tower block. The fire had been less than a week ago. Not a pretty landmark! We arrived at the airport by 9:30 and discovered that the National Express bus station was just across the street from the terminal building. We had an hour wait for the 10:30 bus that we had booked a few days ago in Liverpool. We boarded the bus and headed off on our next adventure. It had been a very nice land tour .